Pass a measure in the 111th congress saying that there will be no filibustering starting with the 113th congress. That would avoid the sense that the reform was a mere power grab. I like this idea a lot. Unfortunately, my understanding of the rules suggests it’s impossible. The only way to do away with the filibuster is via an arcane challenge to a point of order that would be sustained by the vice president while presiding over the Senate. So it either happens or it doesn’t. There’s no way for the 111th congress to pass a resolution that’s binding on the 113th. Hilzoy offers a couple of other alternatives. She notes that modern filibusters are tepid affairs, but there’s a reason for that: old-school filibusters are actually more tiring for the majority than for the filibustering minority. Everybody got tired of that starting in the early 60s, and the reforms that were put in place eventually degenerated into today’s routine requirement for 60 votes to pass virtually all legislation in the Senate. What to do? The Senate might make cloture votes require 60% of the votes of those who are present and voting, for instance. That would mean that the side that was mounting a filibuster would have to keep all its members around for the duration. Alternately, the Senate might adopt a rule that said that during filibusters, if a quorum was not present, the Senator who was speaking could decide to go on speaking or to allow a vote on cloture, to be decided by a majority of those present and voting. If s/he decided to go on speaking, s/he could do so, but no other Senate business could be conducted until the next business day. If s/he opted for the cloture vote, it would take place. Maybe, though once again it’s not clear how this could happen since I think it takes a two-thirds vote to change Senate rules. Stuck again. But as long as we’re chattering about impossible things, here’s my idea: a court case challenging the constitutionality of the filibuster. Basically this would take the form of an originalist argument that the framers always intended for bills to be passed by majority votes in both Houses. This wasn’t spelled out specifically in Article 1, but that’s only because it was such a deeply held assumption that nobody even thought it necessary to put it in writing. Majority rule was quite plainly the default requirement, and in cases where a supermajority was required it was spelled out specifically. 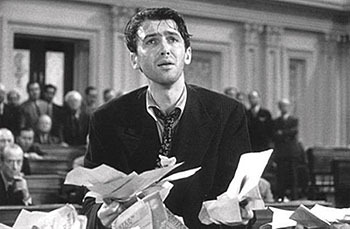 Perhaps there can be some kind of limit on the number of filibusters (kind of like NFL coaches having a limit on how many times they can challenge a referee’s call on the field). James Joyner is enthusiastic too (“Perhaps if they successfully challenge two bills, they get a third!”). Count me in as well. If it’s pie-in-the-sky we’re going to talk about, what better model do we have than professional sports? The NFL might have a bad habit of changing its rules about as often as most of us change our shirts, but at least they manage to crown a champion every year. Compared to Congress, that’s not bad.